EzyDog harnesses are some of the best in the pet industry and we definitely have one that will fit your medium dog perfectly. With many styles to choose from, the features and benefits are sure to match your medium dog’s lifestyle. The Chest Plate Harness features a unique EVA Cheat Plate that will actually form to your dog’s chest for a custom fit. After just a few times wearing the Chest Plate Harness, the chest plate will adjust shapes to that of your dog’s chest. This will keep the harness stable and in place with little to no shifting. The design of this harness is very difficult for a dog to escape from. 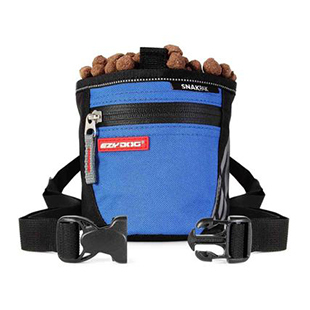 So if your dog is an escape artist, this is the harness for you. 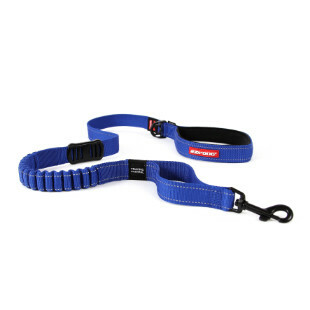 It features reflective stitching, a stainless steel d-ring for leash attachment and comes with a free seat belt restraint for all of our travels by automobile. The Quick Fit Harness is as simple to use as a collar, with all the benefits of a harness. Just slip the harness over your dog’s head and clip the only buckle into place and you are on your way to the park, vet or whatever adventure you have planned. The Quick Fit Harness features a grab handle, reflective stitching and a dedicated loop for ID Tag attachment. The stainless steel d-ring is perfect for attaching a leash. This harness even adjusts across the chest for a custom fit! Just slide the neoprene sleeve to the side and adjust the sandwich Velcro for the perfect fit. The Convert Harness is a utility harness with the ability to convert to a backpack by adding the Convert Saddle Bags. The Convert Harness features badges with different messages that can be swapped out by simply using Velcro. Whether you need to let others know that they should “Ask To Pet” or that you have a “Service Dog” or simply that your dog is a “Princess” the side badges for the Convert Harness will alert on-comers with your message. Your medium dog will love their EzyDog harness and so will you. With so many colors and styles to choose from you can be assured that the perfect fit is available for your pooch.